Karma is a belief that whatever you do will come back to you, either in this life or the next. It is embraced by followers of Buddhism, Hinduism, and others around the world. For some this is not only deeds, but thoughts and words as well. Putting money in a church collection plate and coming home to find some money you had forgotten you had. A coworker steals a cell phone and later on the cell phone is stolen from him. While driving along at a speed below the speed limit, you notice someone riding your bumper. When he gets a chance to pass you, he gestures and roars off. Soon, he is pulled over by the police for speeding. In this true story from South Africa's Kruger Park, a poacher that was trapping in a game reserve was chased by hippos and eaten by lions. King Louis XVI of France supported the U.S. to get back at Britain for taking some Canadian territories in the Seven Years War. Because of this, there was a financial crisis in his country and many Frenchmen were inspired by the revolution. These were factors in the French Revolution when King Louis XVI was overthrown. Eating too much on a holiday can lead to weight gain. A person makes fun of elderly people who have to get around using scooters. Later in life, that person develops very bad arthritis and is confined to a scooter. A boy bullies a schoolmate and later on, winds up working for his victim's father. Soon, the boy's victim becomes his boss. A greedy businessman cheats people, lies on his taxes, and engages in insider trading. He gets caught, goes to jail, and loses all his wealth. In Aesop's fable "The Ant and the Dove," the dove saved the ant from drowning. Later, the ant saw a bird catcher laying out twigs for the dove. The ant stung him on the foot, he dropped the twigs and the dove flew away. In "Harry Potter and the Chamber of Secrets," Gilderoy Lockhart takes credit for other people's achievements then erases their memories. In the end, a memory charm backfires from a broken wand and he loses his memory. In the fairy tale "Beauty and the Beast," the prince does not show kindness to a poor old woman. The woman is a witch in disguise and turns the prince into a beast. In "Polar Storm," a television movie, the main characters knew that anyone inside a car that is hit with an electromagnetic pulse would die. Their car was hijacked and within minutes, an EMP killed the hijacker inside the car. In Star Wars' "Return of the Jedi," the main characters were encircled by Ewoks. They had a choice of whether to fight or surrender. They won them over and the Ewoks became a powerful ally. In Greek mythology, Tantalus tried to steal ambrosia from the gods and was banished. He invited the gods to his home where he killed his children and fed them to the gods. For this, he resides in the Fields of Punishment where anytime he tries to eat or drink, the food and water move away from him. Jason was kind to an old woman, who was actually Hera in disguise. This led to his adventures with the Argonauts. In the "Lord of the Rings," every Ring-bearer that shows mercy to Gollum is rewarded. Bilbo was able to give up the ring later on. In a true life story, a contestant who was on Jeopardy, a television game show, had been on the show 10 years earlier. He was found out when someone noticed he was wearing the same tie as before and he didn't get his winnings. In a South Park episode, Le Petit Tourette, Cartman claims to have Tourette's syndrome so he can say anything he wants. Soon he loses control and actually says things he doesn't want to say. Next time something good or something bad happens to you, take a minute and think about whether it could be karma. "Examples of Karma." YourDictionary, n.d. Web. 18 April 2019. 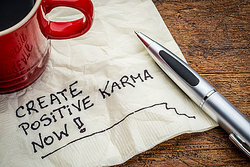 <https://examples.yourdictionary.com/examples-of-karma.html>.